Fig. 1: Left: The mishmash of quantities the author’s monitor in growing planets. At the shock boundary, material accretes at a rate M-dot, and an accretion luminosity Laccr is contributed to the planet’s luminosity. T0, P0, and S0 are the temperature, pressure, and entropy just below the shock. Material settles and compresses in the envelope before reaching the radiative-convective boundary. Sc is the entropy in the core. From Fig. 1 in today’s paper. Right: An example plot showing the regimes of resulting entropy Sf of a 10 Jupiter-mass planet as a function of T0 and P0, after it began accreting at an initial entropy Si. The color scale is in units of Boltzmann’s constant per proton mass. From Fig. 6 in today’s paper. The stalling regime (S0 > Si, and T0 ≅ 1000-2000 K): the planet’s envelope is radiative, and the internal entropy decreases as a function of decreasing radius inside the planet. The final entropy Sf tends to settle near the initial entropy value Si. Fig. 2: Luminosity curves as a function of planet age, in subpanels for different combinations of initial entropies Si and accretion rates. The data points are directly imaged planets. Number 8 is 51 Eri b, the chilliest directly imaged planet found so far, and the closest contender for a “cold” start formation. Letter A is the possibly-still-accreting planet HD 100546 b. From Fig. 12 in today’s paper. 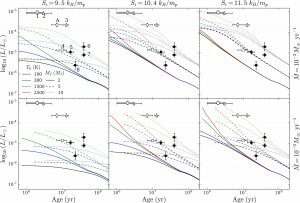 On the theory side, the authors call for models that allow parameters which they kept fixed—like T0 and the accretion rate—to vary in time, and to incorporate more complications like the effects of dust grains, accretion asymmetries, and whatever other individual circumstances may be in play during the formation of a given planet. As the symbiotic trifecta of high-contrast imaging, Gaia data releases, and sophisticated modeling continue to advance, we may yet use the luminosity of young planets to illuminate the broader physics of massive planet formation.